© 2003 Pate-Meadows Designs, Inc. This unique valance is a casual take on a formal style and can be adapted to fit any size window by adding additional swag sections. Our instructions are for a valance that is 40” to 42” finished width. The information needed to add to or reduce the width is included. The finished length of the valance is approximately 21” at the swag, 18” at the middle jabot and 26” at the side jabots. 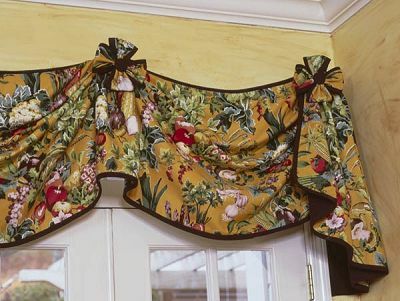 The valance is trimmed in a bias band out of contrasting fabric. We mounted our valance on hidden brackets constructed out of a 4” piece of 1 x 4 and angle irons. These amounts are for a valance measuring 40” to 42” finished, installed width. See pattern for other widths. These amounts are based on 54” wide fabric. * These amounts are based on 54” wide fabric. Allow extra fabric to match patterns and plaids. These amounts are based on unaltered swag sections.